The purpose of a profile on any social media site is to give potential friends and followers a little background on yourself so they get to know you even before they dive into what you post. A great bio also serves the purpose of helping fans find you when they’re searching for people to follow. Follow these three steps to ensure everyone on Flipboard can find you and get to know you even before you start curating Flipboard magazines. Photos are usually the first things people look at when they come across a new bio. Picking a great photo is key; ask anyone who spends time perusing dating sites. The photo you pick says more about you than you might think. It’s smart to put some thought into picking a photo that will give people the first impression you’re hoping to create. Flipboard profile photos aren’t very big, so we recommend choosing a clear, close-up headshot, even if you’re planning on using Flipboard to mostly showcase your blog content. It might be tempting to use your blog logo instead of a personal picture, but faces help people connect faster and when followers feel like they’re getting to know a real person, they’re more likely to become loyal readers. To change your Flipboard bio photo, simply click on the circular picture icon on your profile page and upload a crisp image. Our system will automatically crop the photo to a circle, so be sure that your image is either centered on your face or that you upload either a circular or square image. Yes, you could have a bio that was just a string of relevant keywords, but, while that would help search engines find you, it wouldn’t go very far towards helping potential followers want to know more about you. The trick lies in crafting a sentence that says a lot about you and lets your personality shine through while also including the keywords that will allow the Flipboard search engine to locate your profile. Include keywords that you want to be known for, the fact that you have a blog or are a blogger, what you write about, some of the topics you’ll be creating magazines about, personal interests…anything that you feel might help you be found by like-minded Flipboard fans. The good news is that Flipboard bios can be as long as you’d like, though the app will only show the first 180 characters of your bio. So, without going crazy, allow yourself to be thorough and let your personality shine through! To edit your Flipboard bio, go to your profile page and mouse over the section below your name and Flipboard user name. Click on the little pencil icon that appears and simply start typing. When you’re done, just click anywhere on the page. Your bio will instantly be saved. Step 3: Be sure to share your links! As a blogger, you leave bits of yourself all over the Internet in the form of words, social media posts, and images. Those traces are just as part of your story than your profile image and your scripted bio. As such, we encourage you to leave your links at the end of your bio. Links in Flipboard bios aren’t clickable, though that feature is coming soon. In the meantime, sharing significant URLs still allows potential followers to get your full story. Add links to your blog, any publications you might have, your social media accounts—anything you feel is important for people to know about. Take a look at the following examples for inspiration! 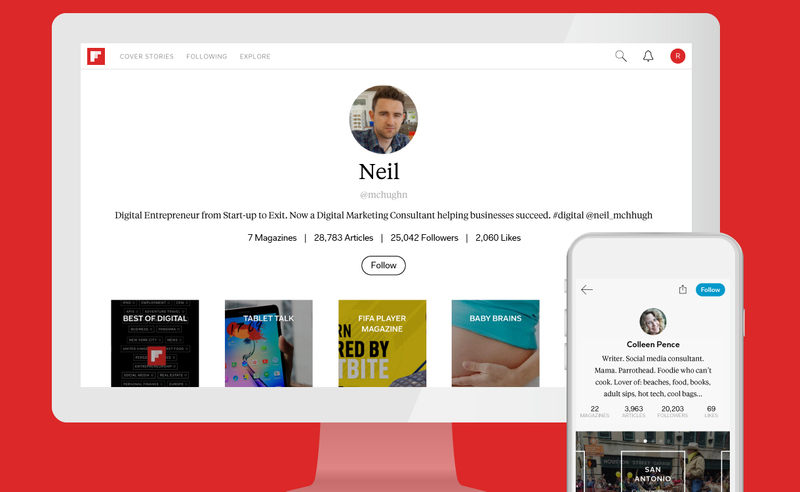 Proud of your Flipboard bio? Share it on Twitter with the #FlipBlogger hashtag!